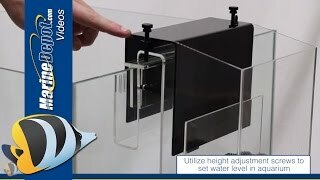 CPR now makes adapters for rimless tanks to use the CS Overflow boxes and still utilize the height adjustment feature. Simply install the CS Rimless Adapter using the adjustment screws to ensure it is level then install the CS Overflow box on top of it as usual. Minimum Wall Thickness Large: 1/4"
Maximum Wall Thickness Small: 5/16"
Maximum Wall Thickness Small: 9/16"
In Arcata, located in Northern California, the sea is a way of life. From the advanced Marine Biology department at Humboldt State University, just up the hill from CPR’s headquarters, to Humboldt Bay, about a mile west, CPR is nestled in a perfect environment to develop equipment for marine aquariums. CPR was started in a small garage in 1987 to produce biological filters for local aquarists. People who used CPR filters were impressed by the high quality and affordable prices. Word spread and the company grew. Since then, CPR has expanded to a 10,000 sq. ft. production facility and has developed many innovative products over the years. CPR is incorporating new ideas and technologies all the time. Their goal is to allow aquarists to place the highest performing products in their tanks at reasonable prices.